From Zero to $100 Million: Growth Lessons from Brian Balfour. Every founder wants to know what will get their company to $100 million, but the usual advice – build a great product – falls well short of providing an actionable roadmap. The truth is, there are plenty of stellar products that struggle with growth, and plenty of subpar products that have achieved phenomenal growth. Product quality is important, but it isn’t a silver bullet. So, what is the secret to creating growth? More specifically, what’s the secret to creating growth that feels almost effortless? I recently spoke with Brian Balfour, Founder and CEO of Reforge and former VP of Growth for HubSpot’s Sales Product Division. In his former role, Balfour, along with Mark Roberge, former HubSpot CRO, and Christopher O’Donnell, VP of Product at the company, led the team developing HubSpot Sales and the HubSpot CRM, a product that in two years grew its weekly users figure from a couple thousand to the high six figures. During his tenure at HubSpot, Balfour learned what it truly takes to grow a startup from 0 to $100 million. 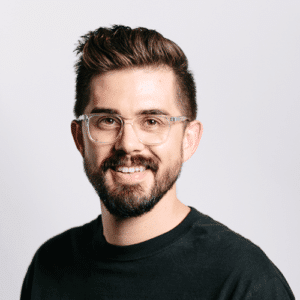 His experience at HubSpot combined with his years working with dozens of other internal and external startups helped him develop an insightful new set of four stages of fit: Market-Product Fit, Product-Channel Fit, Channel-Model Fit, and Model-Market Fit. When aligned in a holistic framework, these four distinct pieces of the growth puzzle are instrumental in helping grow a company to $100 million and beyond. In other words, don’t start with the product and then look for a market and problem that need your solution; start with the market and problem and build your product to meet the real-world need. Going at Market-Product Fit the wrong way is a classic case of putting the cart before the horse. Category: What category of products does the customer put you in? Who: Who is the target audience within the category? There are always multiple personas within a single category, so this breaks it down further. Problems: What problems does your target audience have related to the category? Motivations: What are the motivations behind those problems? Why are those problems important to your target audience? Core Value Prop: What was the core value prop of the product? How did it tie to the core problem? Hook: How could the core value prop be expressed in the simplest terms? Time To Value: How quickly could we get the target audience to experience value? Stickiness: How and why will customers stick around? What are the natural retention mechanisms of the product? One of the key metrics to look at in this early stage to gauge market-product fit is retention. “When I first started working on HubSpot Sales, the first thing we looked at was retention curves,” Balfour says. “We wanted to see what the curve looked like, whether people were retaining on the product. If they are, that’s an indication that the product is delivering a core value.” Once you’ve established that the product is able to retain users, you’re ready to move on to the next piece of the framework. Balfour says that Product-Channel Fit is what will make or break your growth strategy. It’s also another fit that many companies approach from the wrong direction. So, instead of thinking about your product and your channels as independent entities, you need to think of them as deeply interrelated elements of a whole. Then, you have to tailor your product to suit the appropriate channel. For the HubSpot Sales product, Balfour saw that they had a transactional model, a potential audience of millions of sales individuals, and a low friction signup. Based on these attributes, he determined that the best channel options were probably going to be some form of virality and some form of paid marketing. On the flip side, he could quickly rule out the sales and partnership channels since both were too expensive for this particular product to support. “Once we had those hypotheses, we went in and started experimenting,” Balfour says. In his Coelevate piece on Channel-Model Fit, Balfour looks in more detail at where different SaaS models and specific brands fall on the spectrum of low ARPU/low CAC to high ARPU/high CAC. The last piece of the puzzle is Model-Market Fit, a concept Balfour developed based on an idea he’d first heard from Christoph Janz at Point Nine Capital. “The core HubSpot business was mid-market, so our ARPU was somewhere between $8,000 and $10,000,” says Balfour by way of example. “Based on that, the HubSpot marketing product needed about 10,000 customers to create a $100 million business. Within our target audience, there were a million or more of these mid-market businesses, so we only had to capture a very small percentage. That’s a good Model-Market Fit. Elephants – Products that get 1,000 customers paying $100K+ year. These are typically products built for enterprise customers like ServiceNow. Moose – Products that get 10,000 customers paying you $10K+ per year. These are typically products built for the mid market like HubSpot. 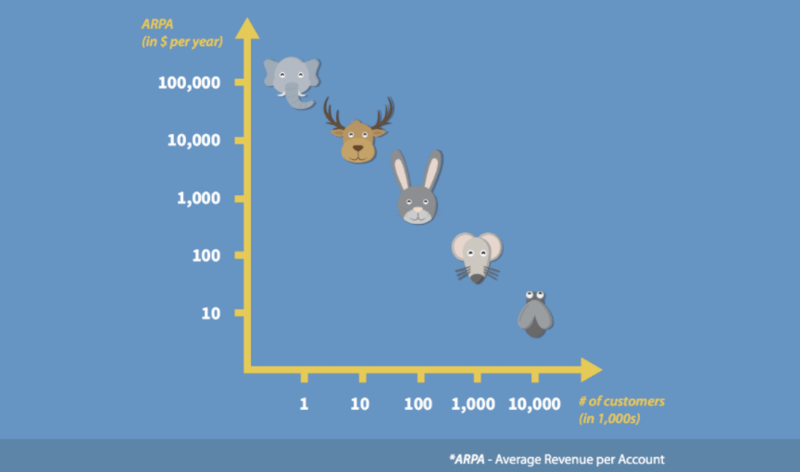 Rabbits – Products that get 100,000 customers paying $1K per year. These are typically products targeting small businesses like SurveyMonkey, Mailchimp, or Gusto. Products targeting consumers at high value moments also live here. For example companies in real estate, insurance, etc. Mice – Products that get 1M customers paying $100 per year. These are typically products that target prosumers like Dropbox, or companies that are subscription eCommerce like Ipsy or Dollar Shave Club. Flies – Products that get 10M customers generating $10 per year typically via ads. Facebook, Snapchat, Buzzfeed, etc. all live here. Balfour’s multi-faceted and highly integrated approach to fit is one that’s worth deeper exploration and real-world application. It’s also something of a moving target because, as he points out, not only do each of these fits influence the others, each one is also always evolving and shifting. When I asked Balfour about how he knows when a product fit is working, he explained that — in his experience — there isn’t one definitive point at which you know that for certain. “It happens gradually,” he says.